With its own Medusa, MB&F’s latest co-creation with clockmaker L’Epée 1839, Maximilian Busser’s creative team successfully counters the demand from the Medusa of Greek myth that we avert our eyes. Once you see the colorful, jellyfish-shaped clock, you won’t be able to look away. 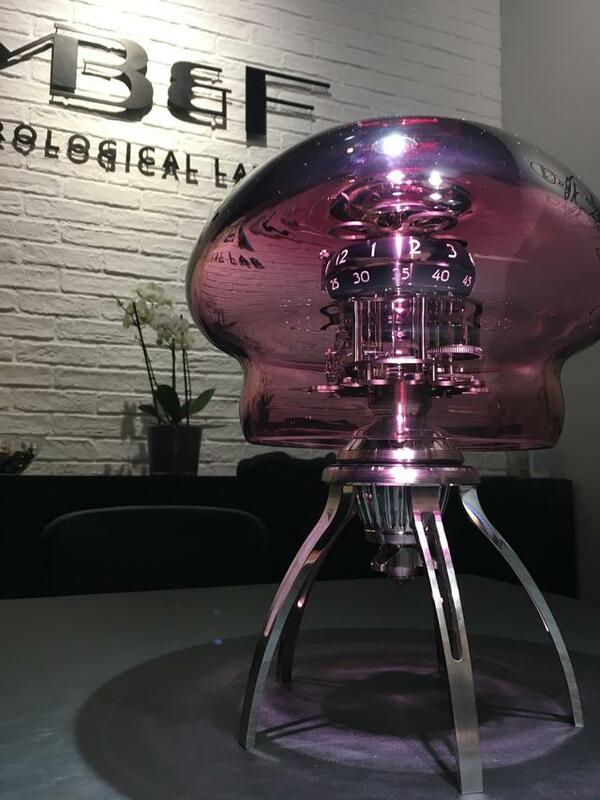 This new clock combines the watchmaker’s propensity for biomorphic shapes (see the MB&F Octopod, HM7 Aquapod, and HM3 Frog, among others) with its desire to push back boundaries in both watchmaking and, with L’Epée’s assistance, clock making. 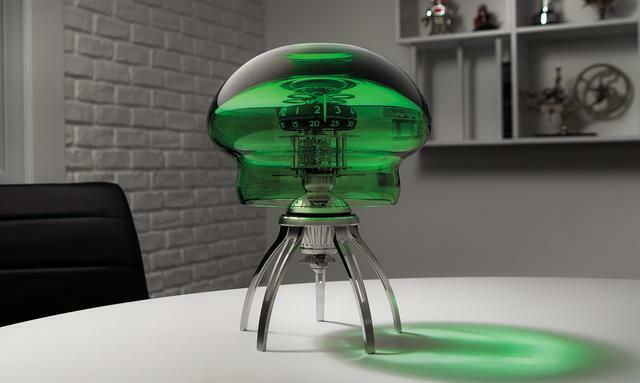 Medusa, the tenth MB&F co-creation with the Swiss clockmaker, finds the team pressing friends to extend their expertise to create a bell-shaped glass clock that glows, stands, can be suspended–and can be wound and set from a single point. The MB&F and L'Epee Medusa, standing. 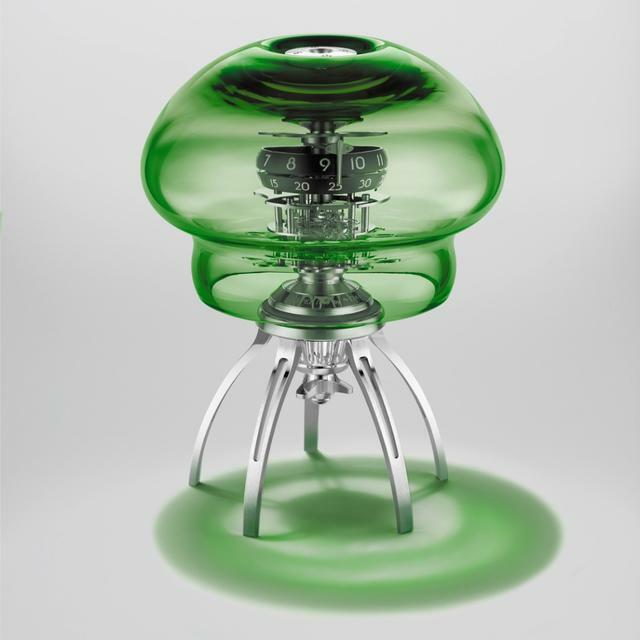 The technical brief that independent designer Fabrice Gonet proposed to MB&F founder Maximilian Büsser appealed to Büsser’s experimental spirit and vision. The team then needed to make Gonet’s imaginative proposal a reality. Crossing the Swiss border into Italy, L’Epée sought one aspect of their design in Venice where they enlisted Murano glass blowers to create the dome-shaped body of Medusa. This assignment wasn’t a simple one. Only after consulting forty different artisans did the team find one with the skills required. The glass needed to appear extremely light and delicate, but also had to withstand the weight of a clock movement. Crafting the color was another challenge. 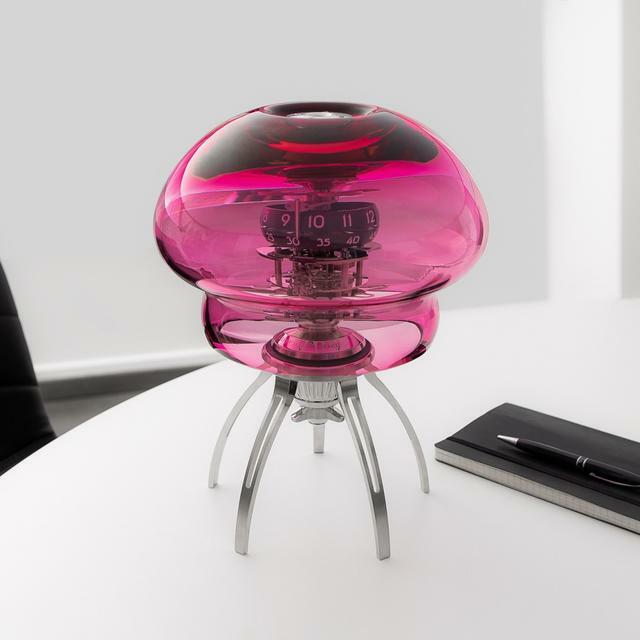 MB&F reports that the pink edition, for instance, required multiple stages of layering red and clear glasses in order to reach the desired shade. Within the hand-blown Murano glass two rotating rings display the hours and minutes, visible through the dome. 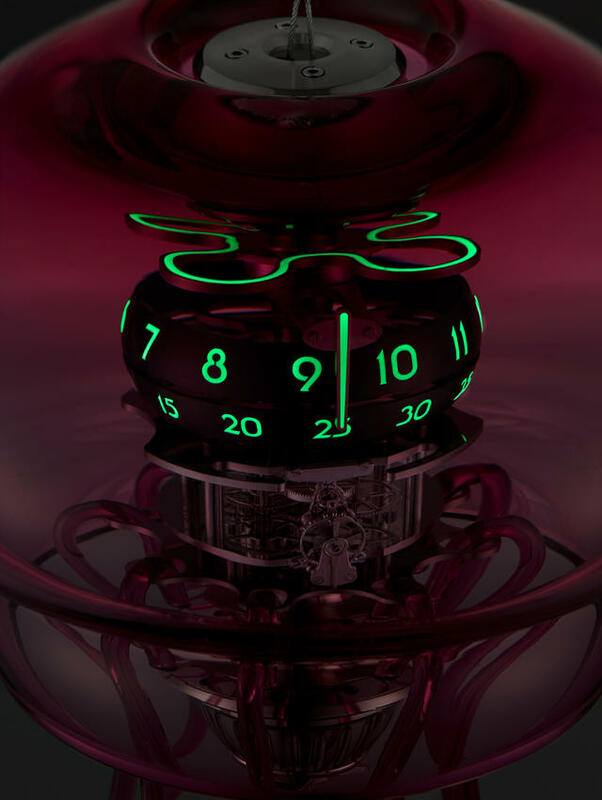 Like jellyfish deep in the ocean, the MB&F Medusa glows in the dark, here using a healthy layer of SuperLumiNova. Underneath the Murano glass, L’Epée’s all-new 155-part, seven-day movement, beating at 18,000 bph, powers the mechanical creature. The MB&F Medusa glows in the dark using a healthy layer of SuperLumiNova. Unlike the other MB&F- L’Epée co-creations, which have separate points of winding and setting, Medusa required a combined system for winding and setting, since the dome limits access to the movement. Thus, the owner can wind and set the clock with one hand, turning a propeller-like handle at the bottom of the movement, while holding the clock with the other hand. Furthermore, to maximize the visual impact of the clock (and to reinforce the biomorphic design inspiration) L’Epee engineered the movement around a central axis to mimic the radial symmetry of a jellyfish’s neural column. Murano artisans also devised glass ‘tentacles’ that can be attached when Medusa is suspended from the ceiling. 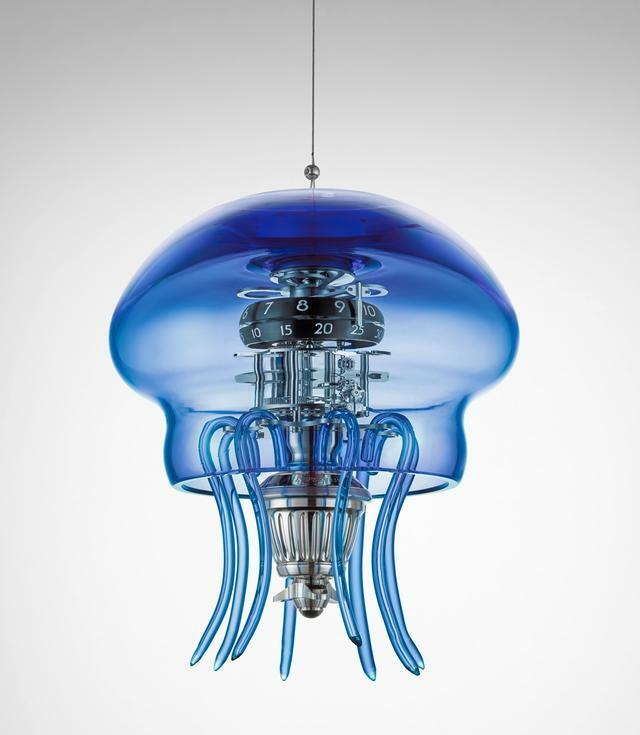 To continue the aquatic illusion, the Murano artisans also devised glass ‘tentacles’ that can be attached when Medusa is suspended from the ceiling, seemingly floating like a jellyfish in water. Owners can also choose to stand Medusa up on a desk or table. Medusa comes in three limited editions of fifty pieces each in blue, green and pink. Price: CHF 25,500, about $25,600.